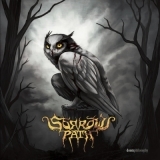 Sorrows Path's latest is a highly listenable modern metal record with doomy, proggy tendencies. Couple of things about this to begin with: firstly you could not accuse Sorrows Path of 'top-loading' this album because on initial hearing the opening two tracks on 'Doom Philosophy' really don't do them justice at all, even if they get a bit better on subsequent listens. Secondly, calling your album 'Doom Philosophy' seems to me to be a reasonably bold move, and also elicits a not unreasonable response along the lines of 'this had better be good'. Which, after a shaky start it is, thank goodness. Due to a somewhat tumultuous and...er...sorrowful past this is only their second full length in the nigh-on twenty years from their inception. Errant drummers and a tragic death amongst the ranks may have seen bands of less sterner stuff folding long before their first full length release. This stoic attitude in the face of adversity comes across not only in their band name but also in the music itself. Likewise one gets the idea from this album that Sorrows Path believe in the old adage that if something is worth doing, then it's worth doing well. They play a brand of metal that builds a number of bridges between certain genres and have even been described as Progressive Power-Doom, which sounds as awful a concept as it is a mouthful. There's no Power-metal here trust me, but there is a healthy dose of well polished Euro Doom, with a foot in both the Trad metal and Progressive camps respectively, and, eventually, after the initial openers, it really does come up with the goods. They certainly look the part too. Check out the video for 'Epoasis'. It will give you a superb idea what's going on with this band. The vocals are an obvious starting point here and flip from sounding like Marilyn Manson in his quieter moments to Rob Halford in his. The Halford comparison is particularly strong if you remember songs like 'Angel' from Priest's 'Angel of Retribution' album or 'Silent Screams', among others, from his solo outings. Powerful they are though nonetheless, and despite these reference points, not a little idiosyncratic. Is that a dirty word? No, not really when you consider singers like Messiah Marcolin or Aaron Stainthorpe both plough equally unique vocal furrows to superb effect. The musicianship is pretty stellar too. Keeping Candlemass in mind, if you like the lead guitar work of Lars Johanson and the overall feel of their later post-Messiah reunion albums then you should feel very at home here. Despite the crisp modern sound, intriguing song structures, keyboards, guest female vocals and proggy aspirations, 'Doom Philosophy' is a far more traditional metal album than it probably wants to think it is. There are tons of well worked melodies on offer here, some great riffs along with a liberal use of power chords and even if one suspects there might be a couple of seven string guitars thrown in from time to time and the odd down-tuning, it still errs heavily on the side of the traditional. Production-wise it sounds great and it's been very well mixed: nothing is left out, with all the component parts being offered space to breathe and also given centre stage when required. This gives those aforementioned leads with their crunchy palm-muted runs and shrill finishes the deserved limelight. If your music collection features a goodly chunk of the Nuclear Blast roster then you should think about giving this a spin. Conversely, if you think of Darkthrone as the commercial end of the metal spectrum you might want to steer clear. All in all then a very enjoyable romp from almost start to finish, a highly listenable modern metal record with doomy, proggy tendencies, and while it may not stay long on the turntable and doesn't break too much new ground, if as the title suggests this is their 'Doom Philosophy', then Sorrows Path can count me in as someone who has listened, learned, and had his traditionally 'sludgy' horizon gratifyingly broadened. Which is sometimes what it's all about. Editor's note: Official video for 'Epoasis' on YouTube. Visit the Sorrows Path bandpage.